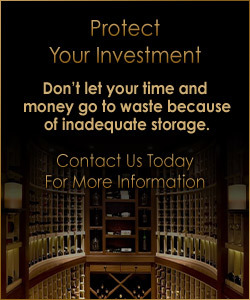 At signature we offer endless solutions to your wine storage requirements. Whether you need storage for 200 bottles or 2000 cases we can provide you with the finest crafted wine storage in the industry and on a budget that works for you. Contact us today for a personal consultation. Modular racking is available in Western Red Cedar, All-Heart Redwood, and Malaysian Mahogany. Custom racking designs can be tailored to meet your storage needs as well as your budget. Our custom wood racking systems are available in multiple styles and materials, this is the wine collector’s playground. Choose from numerous molding packages, design features, and finishes to create a unique and personalized wine cellar. Vintage View Wine Racking is the ultimate in metal racking solutions. Their unique style and functionality offer an even greater choice for storage solutions. If a wine cellar is more than what you need, perhaps a custom wine cooler or cabinet would suit your needs. For multiple user storage, wine lockers are a fast growing means for wine storage at country clubs, private clubs, and restaurants.